Some of Africa's Biggest Baobab Trees Are Dying Off : Goats and Soda A new survey of baobab trees in Africa finds that many of the oldest have died or significantly deteriorated in the last decade. Scientists say climate change and human intervention could be culprits. Baobab trees along a dirt road called the Avenue of the Baobabs in Morondava, Madagascar. Baobab trees — ancient, otherworldly behemoths with bulbous trunks that splinter into a constellation of spindly branches — are some of Africa's most iconic living things. Until late last year, the Platland tree in South Africa, also known as Sunland, was their queen. It was the continent's biggest baobab, at 111 ft. around, 62 ft. high and more than 1,000 years old. It had a cavernous central hollow that hosted a fully functional cocktail bar with seating for 15 people. Beginning in Spring 2016, the tree began to split apart. By November 2017, it had crumbled completely. The bar's owners blamed rot caused by heavy rain and threw a barbeque to honor its passing. But if the Platland's demise was sudden and tragic, it wasn't unique: A new survey of baobab trees across several countries in southern Africa found that most of the two dozen oldest and biggest trees have died or significantly deteriorated in the last decade. 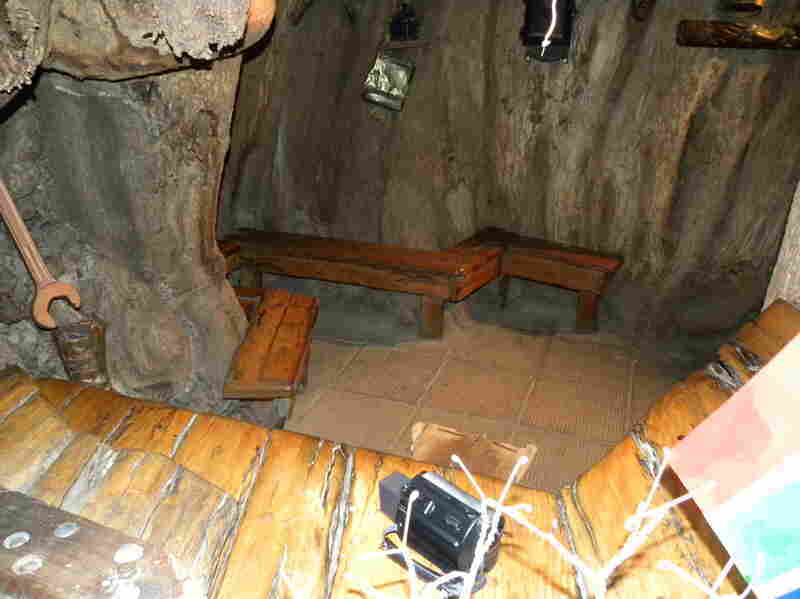 The Platland tree in South Africa was the home of a cocktail bar until it started to split apart. Scientists are wondering what's behind the mysterious die-off — and are looking at climate change as a likely culprit. "Such a disastrous decline is very unexpected," says Adrian Patrut, a chemist at Romania's Babeș-Bolyai University who organized the survey, published Monday in the peer-reviewed journal Nature Plants. "It's a strange feeling, because these are trees which may live for 2,000 years or more, and we see that they're dying one after another during our lifetime. It's statistically very unlikely." 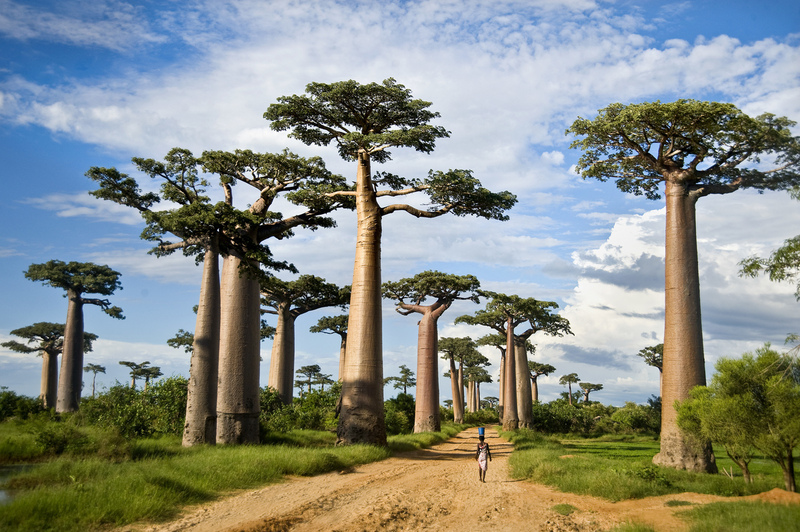 Patrut began to notice the deaths during a long-term effort to use radiocarbon dating to gauge the ages of major baobabs. Patrut's survey began in 2005 and eventually covered more than 60 trees. Of these, a group of around two dozen stood out for their exceptional size and, or, age. This included the Platland baobab and a few trees that appeared, by Patrut's calculations, to be more than 2,000 years old. Baobabs are notoriously tricky to date because their strange shape and growth patterns can complicate traditional tree-ring analysis — and Patrut's method drew some controversy from other baobab ecologists. But his finding about the deaths came as no surprise: Anecdotal evidence of a die-off was already spreading in the baobab research community. Patrut says more research is needed to understand the cause of the die-off, but he believes the most likely explanation is climate change. "These trees are under pressure by temperature increases and drought," he says. Scientists are growing increasingly worried about the status of baobab health across Africa, according to Carla Staver, an expert on savannah ecology at Yale University. The survey "is consistent with a lot of concern in the conservation community in southern Africa about [baobabs'] long-term persistence," she says in an email. "Climate change certainly seems like a possible (or likely) contributor." Do Tree-Climbing Goats Help Plant New Trees? Southern Africa — including countries like Botswana, Namibia, South Africa and Zimbabwe, where the trees catalogued by Patrut were found — is already warming faster than the global average. Scientists predict that over the next few decades it will experience some of the continent's most intense increases in temperature and decreases in rainfall. Baobabs, especially old ones, can be more vulnerable to drought than their grizzled appearance might suggest, says David Baum, an ecologist at the University of Wisconsin-Madison. But more evidence is needed, he says, to strengthen the link between climate change and the baobab deaths. Other factors, including human interference with individual trees (installing a cocktail bar, for example), could also be responsible. In any case, Baum said in an email, "it is very likely that human actions, whether by changing the local landscape or altering global climate, have contributed to the death of so many large baobabs." Baobabs have deep cultural significance for many communities across southern Africa. A common myth among the indigenous people living near southern Africa's Zambezi river holds that the earliest baobabs were vain about their massive size, and as punishment were ripped from the ground by the gods and replanted upside down, with their roots in the air. They are often the site of shrines and meeting places, and support self-contained ecosystems of mammals, birds, reptiles and insects. The Platland tree in South Africa was Africa's biggest baobab tree before its death last year. The cavernous interior held a cocktail bar that could accommodate 15 people. The trees could also be an underappreciated solution to economic development and food security in rural areas, according to research from the Kenya-based World Agroforestry Center. The fruit is nutritious, with up to 10 times the vitamin C of an orange — and there's a booming global market for products made from the leaves and seeds, including cosmetics and herbal medicine. 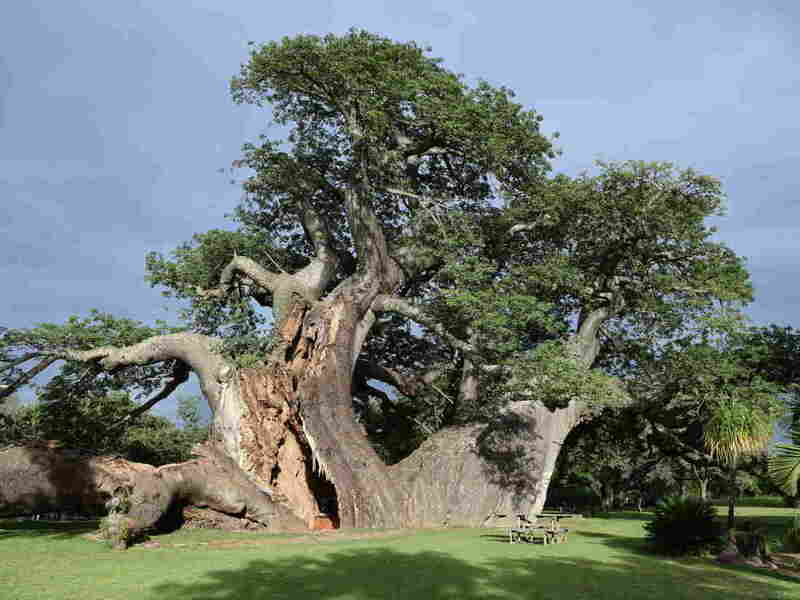 The oldest tree in Patrut's survey was one in Zimbabwe called Panke, which died in 2011. According to Patrut, it was around 2,500 years old — meaning that it sprouted a few years after the founding of the Roman Republic. But baobab dating is a tricky, controversial process. Baum says that many baobab specialists are dubious of Patrut's tree dating method, which could underestimate the age of a tree by up to 1,000 years. The problem is the tree's so-called "architecture." Baobab bark is a favorite snack of elephants and is susceptible to rot. Because of these pressures, from a young age baobabs become pockmarked with "scars." The common theory, Baum said, is that as the tree slowly grows around these scars, they can become large hollows. In a typical tree ring, it's easy to trace a straight line from the oldest part at the center to the youngest part at the edge. But on a baobab, new wood grows both on the outside and into the hollows, meaning that a straight line from the center of the tree can pass both forward and backward in time — or even skip decades altogether if they rotted out or were eaten. That makes it very hard to know which part of the tree is the oldest, or even to know if the oldest parts still exist. But according to Patrut, the big central hollows were never filled with wood, and are instead the result of independent trunks fusing over time with a gap in the middle — "the only reasonable explanation," he says. Diane Mayne, a baobab ecologist who worked with Patrut in South Africa, called his theory a "fantasy" that lacks "a single reference on wood, anatomy, allometry or biomechanics or the hollowing process — despite recent research in these fields." A spokesperson for Nature Plants says the paper followed the journal's normal review process, which involves peer review by two or three outside experts. The architectural debate doesn't change the finding that so many trees are dying off. But it matters because correctly identifying the oldest part of a tree is a prerequisite for knowing its age. And a better understanding of the trees' ages may help conservationists know which baobabs may be the next to go — and to offer a chance to support and protect them before it's too late. "The decline and death of so many large baobabs in recent years is so tragic," Baum says. "It is heartbreaking that any should die — but even worse that we might be seeing the beginning of the end of all the giant baobabs on the planet." Tim McDonnell is a journalist covering the environment, conflict and related issues in sub-Saharan Africa. Follow him on Twitter and Instagram. An earlier version of this story stated that the oldest tree in the study, according to Patrut's dating, would have sprouted a few years after the assassination of Julius Caesar. In fact, it would have sprouted a few years after the founding of the Roman Republic.